Extrusion is a technique where heated materials such as aluminium are forced through an opening to form a shaped profile. To produce an aluminium extrusion, an aluminium billet (a solid block/log of aluminium) is heated to the required temperature then loaded into the container of the press, it is then then forced through a shape created in a specially manufactured tool called a die. 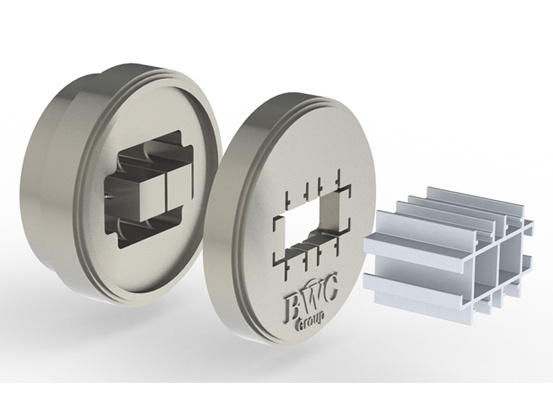 Once the aluminium has been pushed through the container by the ram within the press, it will form the extruded profile which will be the same shape as the opening in the die. The size of an extrusion is measured by the size of its cross-sectional dimension. This is it’s fit within a circumscribing circle. 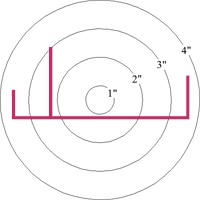 The circumscribed circle (cc) of the profile will determine what size extrusion press it can be extruded on. Several factors dictate as to what size press the profile can be extruded on. Overall size is one, but also there can be multiple cavities within one die. There are significant forces generated when pushing a billet through the die, so it may be necessary to create more cavities within the die, therefore increasing the overall weight/mtr across the die. This enables the aluminium to flow through the die without too much negative pressure. In simple terms it is a bit like holding your thumb on the end of a toothpaste tube and trying to squeeze it out. It will not come out, but if you move your thumb slightly, the toothpaste will flow more freely. Alloy – Chemical composition of other elements added to pure aluminium to enhance its properties such as strength, etc. Extrusion Ratio - Area of the billet/area of the shape. Tongue Ratio - Width of the gap vs. its depth. Tolerance - Limits of variation in which a part or product can be produced to. Finish – Treatments used to enhance the end look & feel of the profile. Factor - Perimeter of Shape/ Weight per metre. A profile which is designed beyond these limits may possibly not be extruded successfully. All the above factors are interrelated in the extrusion process along with extrusion speed, temperature of billet, extrusion pressure and the alloy being used for extrusion. These will all contribute to and determine the cost of your extrusion. The lower the temperature, the higher the pressure that’s required. Lower temperature extrusions typically produce shapes that have a better surface quality and dimensions which are more accurate. Higher billet temperatures and faster extrusion speeds means metal flow becomes more fluid. The metal flow usually tends to fill the larger voids in the die face and resists trying to fill constricted areas. The shapes dimensions and tolerances are compromised using this method and often the profile is unsuccessful. Extrusion Ratio: Area of the billet/area of the shape. The extrusion ratio is the ratio of the area of the work billets cross section (Ao) to that of the extrusion's cross section (Af). The extrusion ratio, or reduction ratio, can be expressed as (Ao/Af). There is a general rule that if an alloy has higher mechanical properties the extrusion rate needs to be lower. The extrusion ratio will be a clear indication to the amount of mechanical working that will occur as the shape is being extruded. If the extrusion ratio of a profile section is low, then parts of the shape will have less mechanical work performed on it, especially the shapes largest mass of metal. Shapes with an extrusion ratio of less than 10:1 are not to guaranteed to mechanical properties. When the extrusion ratio is higher, greater pressure will be needed to force the metal through the smaller opening in the die, this means that intense mechanical working will occur. The above ranges all depend on the shape of the extrusion. 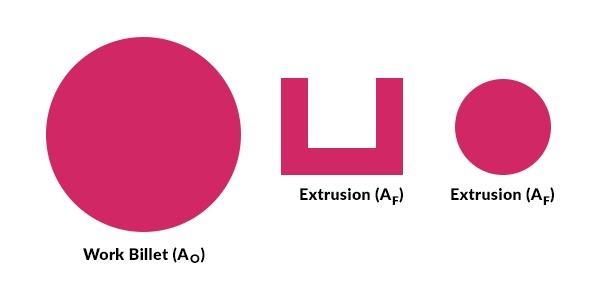 Typically, the higher the extrusion ratio, the harder it is to extrude the part. Maximum pressure will be needed for hard alloys that require the lowest billet temperature. This results in poor surface characteristics. Factor: Perimeter of Shape/ Weight per Metre. Performance is also defined by the parts difficulty factor. The size of the press will determine how large an extrusion profile can be produced. Usually, the lighter a section is, the smaller the press you will need to extrude it unless you’re extruding a large, hollow shape with thin walls. The higher the factor is, the harder it is to extrude. Tongue Ratio: Width of the gap vs. length or height. The parts Tongue ratio will also be will a factor to the success of your parts performance. Tongue ratios can be worked out by doing the following; square the smallest opening to the void, calculate the total area of the shape, and then divide the opening squared by the area. The higher the tongue ratio the more difficult it is to extrude. 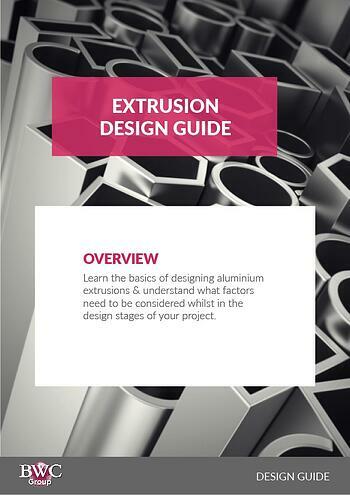 You can learn more about the factors involved in the extrusion process in our Aluminium Academy. Marketeer extraordinaire, Alix brings you all the latest developments from BWC. She has a great eye for design, and has a knack for finding ways to match our services to our customers needs.